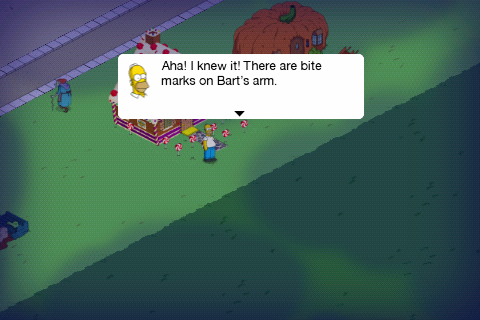 The 10th and final Personal Prize is won by collecting either 10,000 Goo or by using 335 Donuts. 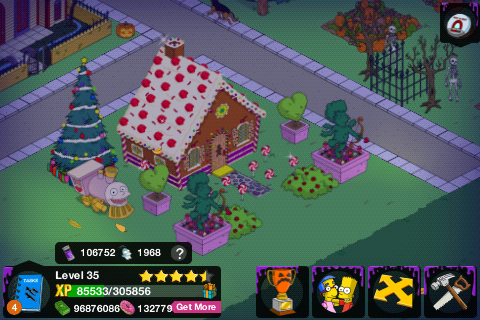 The prize is the Gingerbread House which ultimately unlocks Suzanne the Witch when the house is placed. 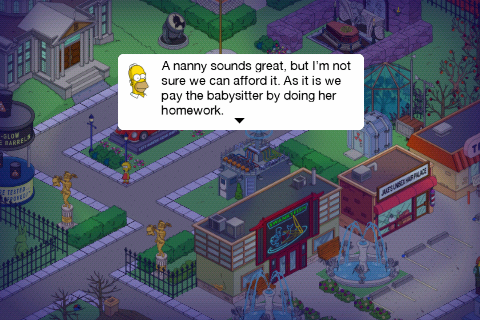 It will also unlock a 5 part quest line which is kicked off by, you know who, Homer. Here’s my breakdown of this combo. 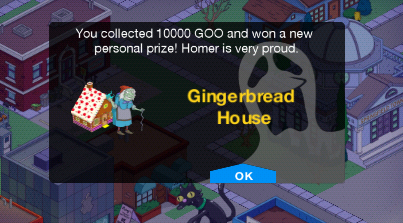 You collected 10000 GOO and won a new personal prize! 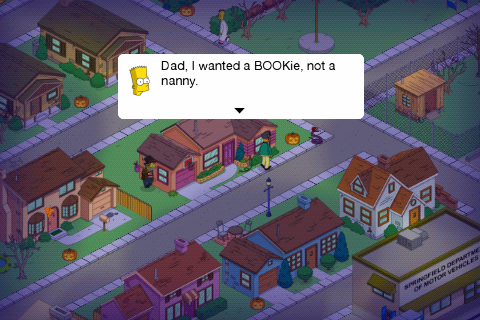 Homer is very proud. 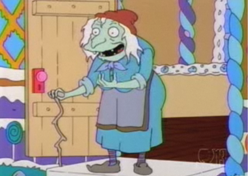 Suzanne and her gingerbread get-up comes from Treehouse of Horror XI, which was the very first episode of Season 12 (November 1, 2000). 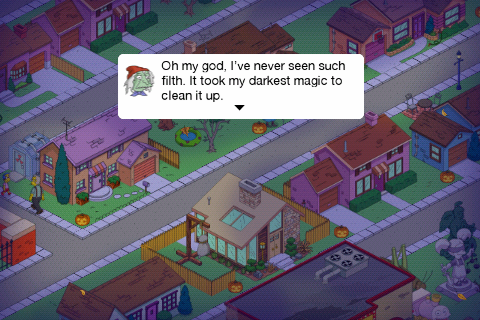 In the second short titled, Scary Tales Can Come True, the Simpsons find themselves as peasants living in a pumpkin house. 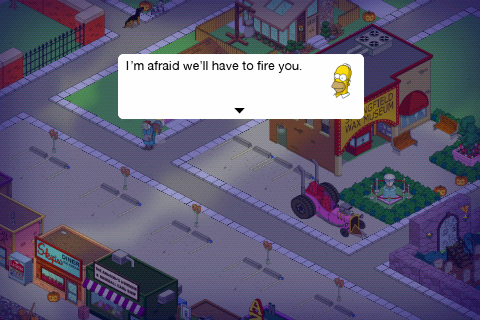 Homer gets fired as the village oaf and vowing he will not let his kids starve, he throws them out in to the woods. IN a comical take on Grimm’s Fairy Tales, the kids end up at a gingerbread house where the witch invites them in pretending to be nice. 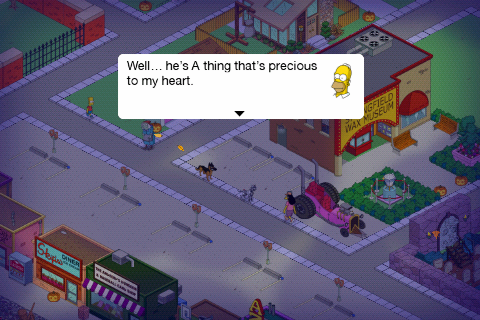 She is anything but and Lisa ends up in chains as a slave as Suzanne tries to fatten Bart up in an attempt to eat him. 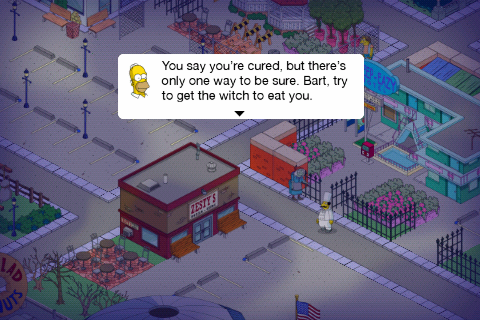 Homer ends up saving the kids but not after being transformed into a part-chicken, part-fish by the witch’s evil spells. 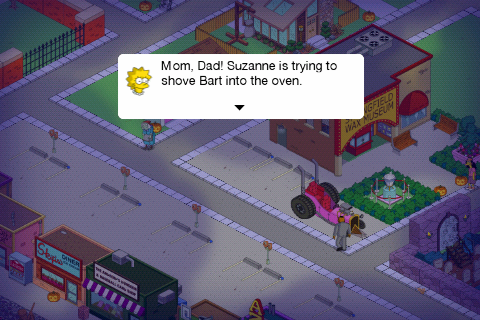 The witch ends up being cooked in her own oven. Suzanne gets the next prompt so keep her available. Again Suzanne gets the task bubble to continue. Once again Suzanne gets the prompt to continue the next quest. Keep her free. 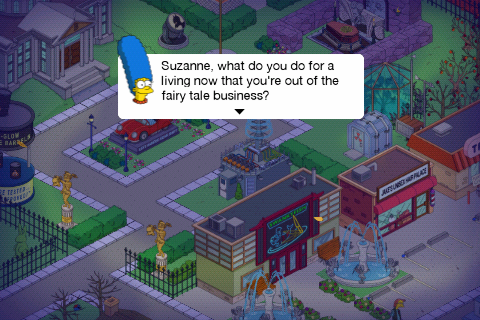 Suzanne gets the prompt bubble for the final part of this quest. And with that you will have successfully completed the Hex in the City side-quest. Short and sweet and pretty darn funny if you ask me. While I was hoping for more visual tasks in this quest and just about all of the other one’s it still ends up being an incredible event and lot’s of awesome content. Now all we have to do is tap, tap, tap and win the remaining Community Prizes. Nothing, you’re quest line will be 1 part shorter. You just won’t get the dialogue and task for it. Has anyone else lost Lisa? Can’t find her anywhere. 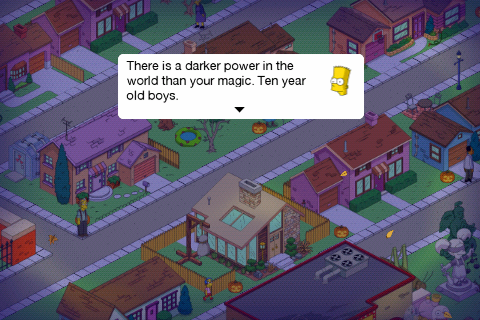 For some strange reason i have a quest for bart to do but he is not in my town. 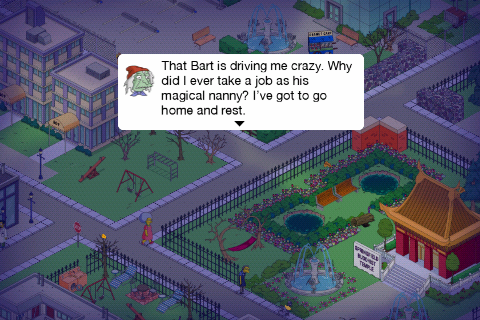 When i click on the quest to go to bart it shows him for less than a second and he disappears. Is anyone else having the same problem with one of their characters? 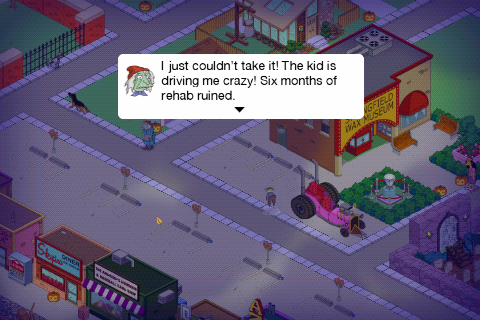 It is a huge glitch that came with the update. We’ve reported on it in a few posts. EA is supposed to release a fix for it. Could you please write a post about the last year buildings/costumes if they are worth buying? Thanks! 1 has a bonus of donuts? 2 if you are how many donuts? 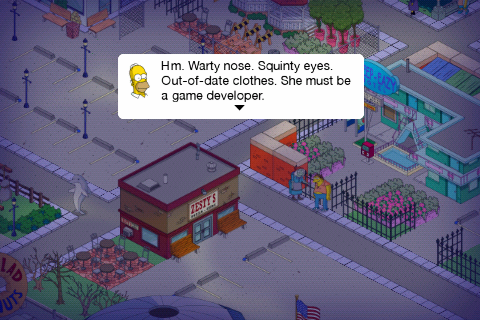 from already thank you and I am still without any news homer patch fix please let me know thank you! Not sure what you’re asking but for this post the final prize is 10,000 Too OR you can buy it with donuts. Once you win all 10 prizes you will then have a bonus chance to win up to 3 donuts for every 2,000 Too that you collect. Hope this makes it through translation for you. Não sei se o que está pedindo, mas para este post, o prêmio final é 10.000 Goo OR você pode comprá-lo com donuts. Uma vez que você ganhar todos os prêmios de 10 você terá então um bónus poderá ganhar até 3 rosquinhas para cada 2.000 Goo que você coletar. Espero que isto torna através da tradução para você. 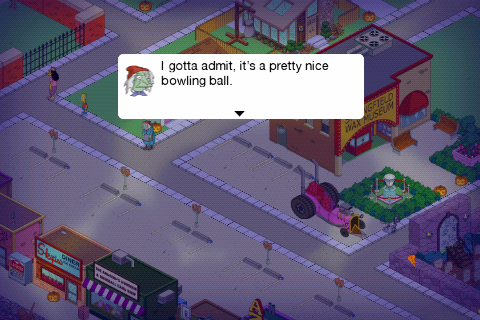 Do you need Barney ‘s Bowlarama to complete the questline? You know that’s a great question. 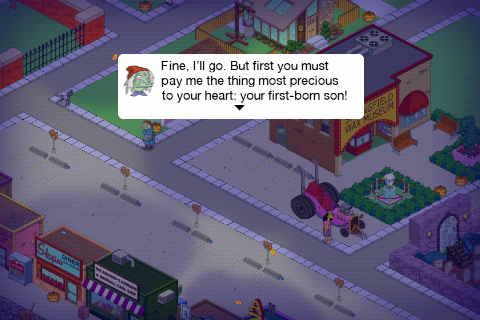 No premium items have been required thus far but I have everything so I’m not sure how it goes without the Bowlerama. I’d like to know myself now. It definitely never prompted me to send her bowling, though. Hope that helps! Where does this quest end when a player does not have Barney’s Bowl-er-ama? Never got the prompt for Suzanne to rest with a migraine in the gingerbread house for 8hrs. I was just asked the same question and I honestly do not know…. Yet. But I will figure it out. I didn’t get any prompt at all after resting from a migrane, and I don’t have the Bowl-a-Rama. The quest just ends there. 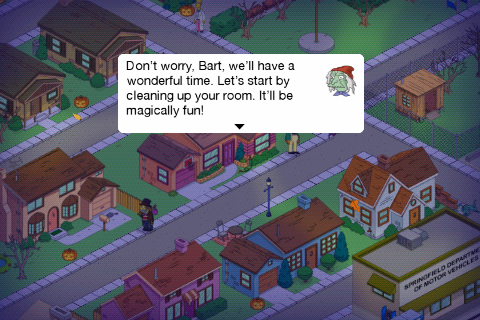 I curious if anyone else noticed the “Fat in The Hat Quests” tombstone on the game’s splash screen? 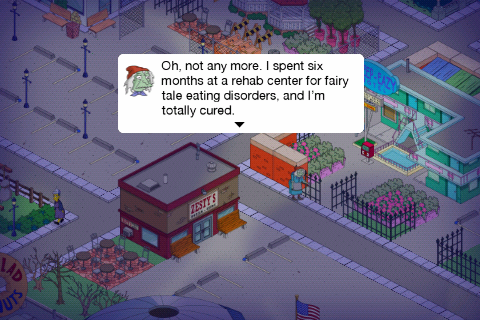 Makes me wonder if the “Hex in the City” quest and some of the other items, which seem oddly disconnected, were replacements for something from the THOH episode.? Mmmmm… Candycanes! Putting it on the wishlist for xmas decorations! What happens if you do not have the bowlarama?